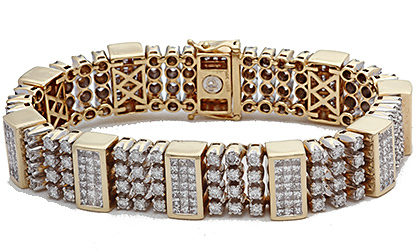 Eye poping 14k yellow gold and diamond gents bracelet. This heavy 7 inch bracelet is set with 120 fine white round brilliant cut diamonds, and 210 fine white princess cut diamonds. Estimated at a whooping 14.40 carats total diamond weight! Like new condition estate item.